Another blog post, another Mac OS update. Do you really want to talk to your Mac? In late September, Apple introduced Mac OS X.12, (Sierra) as a free upgrade, available (as usual) in the App Store. 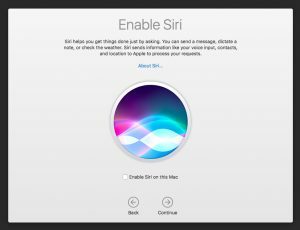 While there are some features that will have Apple fanboys and fangirls excited (Siri on the Mac, the ability to login to your computer via your Apple Watch), most of the action takes place behind the scenes. In other words, functional, but not all that exciting. Think before blindly syncing your files to the cloud! But the biggest issue I have discovered with updating to Sierra is during the configuration process, post restart, after the software has been downloaded and installed. There is an option to enable Siri (see graphic above), but the next one that comes along – to move all your documents into iCloud Drive – is troubling. That’s because you potentially will be forced into upgrading (e.g. paying Apple for more storage capacity). Worse, your data will have been forcibly migrated into “your” iCloud Drive (which means it’s also stored on Apple’s servers somewhere out there). iCloud Drive’s tagline is “All your files. On all your devices.” Which is fine and dandy – but that’s exactly what Google Drive, Dropbox and others do just as well. Doing something as rash as moving all your files out of their familiar homes and into the cloud is something you need to put a lot of thought into – not just go willy-nilly with the defaults of an OS update and hope for the best. 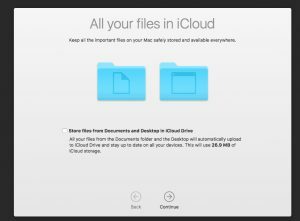 Understanding exactly how iCloud Drive works and exactly why you would want to take such a large step with your valuable data are things best thought out beforehand. It’s like deciding who to vote for after the curtain closes behind you in the voting booth. Not the best way to handle an important decision.